Recently I am trying to enable the PCIE ASPM and PCIE Native Control on my MSI GE62MVR which may allow CPU to get into deeper package c state and extend its battery life. I plan to do this by changing bios settings in NVRAM/COMS by a EFI Shell called GRUB, but when I am looking into the address of those setting I notice several settings are using the same address. As you can see they share the same variable address:0x4, I think if I directly use Steup_Var 0x4 0x1 will mess up other options. And I also use the commad Setup_Var 0x4 to read the value in it, I was surprised because it told me offset 0x4 is 0x00 and 0x01 at the same time, how can that be possible? Do anyone can help me with this? Thanks. Upload the setup file, that looks possibly incomplete IFR. Also, to save time so I don't have to request later in case I need another part of the setup, please go ahead and upload the entire BIOS file. Ohh! Wait! I see now! Those where you have "Variable 0x4" are the values, but without a variable name ID shown in front of that. Looks like the middle and last one are the only ones missing names/correct VarName/VarOffset ID variables. Shoot me the BIOS and I'll check it out for you, and if necessary send you an updated IFR app. Some BIOS have names/ID's removed like that, so you can't easily edit. Your IFR may be valid and correct above, but it looks confusing how it's shown, so I posted all this just in case it's wrong, so you can see what you should be expecting to look for to change. (11-05-2018, 12:56 AM)Lost_N_BIOS Wrote: Upload the setup file, that looks possibly incomplete IFR. Also, to save time so I don't have to request later in case I need another part of the setup, please go ahead and upload the entire BIOS file. There were some structral problem with the codes I post, they are correct now, sorry for the confusion. Thanks, I find similar! I think something has to be done with VarStore in the command, like Varstore + Var ID, but I am not sure what. I've always seen this 0x0 or 0x1, but in your BIOS, especially where there is same ID 0x4 you mentioned, the VarStore ID is different. (11-05-2018, 03:50 AM)Lost_N_BIOS Wrote: Thanks, I find similar! I think something has to be done with VarStore in the command, like Varstore + Var ID, but I am not sure what. I've always seen this 0x0 or 0x1, but in your BIOS, especially where there is same ID 0x4 you mentioned, the VarStore ID is different. Your IFR is very helpful! I realized that these options are stored in different segments correspond to their VarStore ID, and the VarOffset is their addresses inside their own segments, on top of the IFR document I can find each segment with their VarStore ID, Name and GUID. Find it!, the name of this segment is 'Setup', its GUID is 'EC87D643-EBA4-4BB5-A1E5-3F3E36B20DA9', you can see it perfectly matches the green underline in my screenshot below. 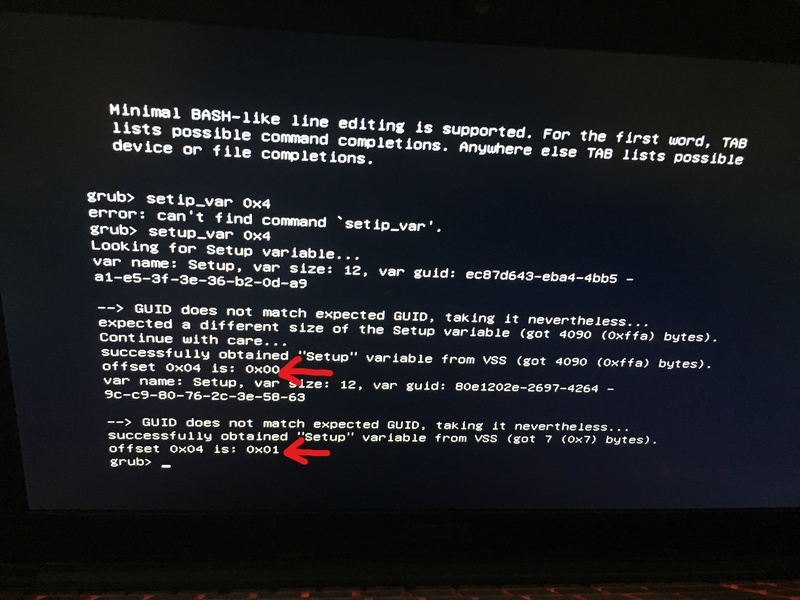 I have seen the GUID does not match error and had no problems before, but as we've noted this BIOS is different due to the way it's setup. But for now everything I want to edit is in the first setup (GUID:EC87D643-EBA4-4BB5-A1E5-3F3E36B20DA9) , I don't know what is it in the hidden one, but if I simply use Setup_Var command it will change both setup, which is the situation I am trying to prevent. Run the tool I sent you in PM, maybe you can change that way and not have to worry about doing this grub stuff. As for grub, there must be some way to specify Varstore ID when entering a command, but I don't know enough about that. Maybe some of the Russian linked info above can help, did you translate it yet? What I think you may be able to do, use normal grub to edit one (effectively editing both) then use setup_Grub2 modified one to edit only the hidden one back to what you want it to be, last. // Copyright (c)2013 American Megatrends, Inc. The modified grub I am using right now is the first one by brainsucker, I tried the Stup_var2 command but it will still change both offset. I haven't tried the second one yet. but I find another efi shell called RU.EFI, is it possible to help? I don't know about the RU.EFI. I did think of something though, if you only want one changed, you can simply direct edit the setup module and put back in BIOS to reflash. Then only that one will have the changed values. If you want to do that, please zip some images of your BIOS for me, one showing Main section, another showing all visible sub-sections/sub-menu entries in Advanced (If you have advanced), and chipset if you have that one. Make sure at least one or all of the images also show all current visible tabs/sections you have in the BIOS, I'll see what I can do to enable it all to be visible for you.